We never stop learning. And it’s a special feeling when a child teaches you things you never knew. I’ve had two examples of this in the past week. My six year old son Owen started teaching me the piano, passing on what he’d learned in his first piano lessons. Then the older brother of one of his friends opened my eyes to the extraordinary story of Rosa Parks. James had come round to get some tips about giving a presentation. It was under the ever-popular theme of ‘what if’. James had chosen a profoundly important subject for his talk. He imagined Barack Obama wondering whether he would ever have reached the White House had Rosa Parks not refused to give up her seat to a white man that winter 1955 day in Montgomery, Alabama. I had heard of Rosa Parks, but I barely knew her story. James prompted me to find out more. Sixty years on, it’s almost unbelievable that someone could be ordered to give up her seat to someone because of the colour of her skin, and arrested for simply asserting her rights as a human being. Or that buses could have separate sections for black and white people. Rosa Parks wasn’t the first person to refuse to accept apartheid in America. But she became famous and in time named the first lady of civil rights by the United States Congress. Sixty years on, it’s good that schoolchildren in Britain are inspired by Rosa Parks. When I was at school, I was taught about the traumas of Ireland and Wales in the 19th century, rather than the struggles of black people to achieve equality just eight years before I was born. I wish I’d been taught about this iconic figure. We all owe Rosa a huge debt. PS: learning from children reminded me that in Welsh the same word, dysgu, means to learn and to teach. How appropriate. 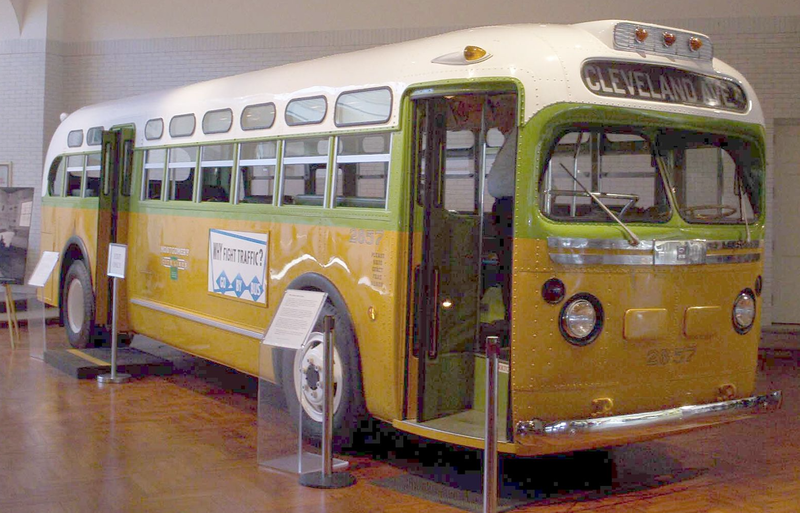 This entry was posted in History and tagged Rosa Parks by Rob Skinner. Bookmark the permalink. I’m pretty sure we learnt about Rosa Parks in my primary school in Cardiff. I think it’s because it was before the national curriculum, mid to late 80s, and the longstanding junior years teacher, Mr Morgan, used to regularly travel to America and would teach about the country as a theme. That’s good! We didn’t do any American history at Lakeside or Cardiff High. It was all Welsh, British and European history.